It’s Orchard in Bloom time again in Indy. This garden show officially opens tomorrow and runs through Sunday. One of the features of the show is the “Events in Bloom” tent. 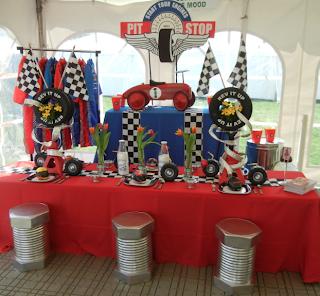 Here are some pics of our kids race theme table. This entry was posted in indy 500 party, race theme party, vintage racecar party on April 29, 2011 by Setting the Mood. Aw Susan!! You are so sweet! We must meet someday!! Thanks for all of your wonderful comments! I think YOU are super creative and talented! !